The SolePath Institute is pleased to announce the launch of Dr. Debra’s new book on Amazon in both hardcopy and kindle versions. 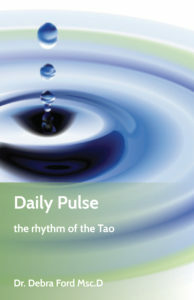 The Daily Pulse is rhythm and ritual that helps you cope with life’s challenges and is the start of a journey of deep self awareness that leads to happiness. The Daily Pulse reminds you that personal change happens in small steady steps each day. That the transformation of how you feel, happens in the gift of time spent alone, in the rhythm of an inner process. The Daily Pulse is for you if you are going through change; if you are feeling stuck and helpless; if your life feels as though it has no meaning; if you are experiencing any of life’s challenges including divorce, a difficult medical diagnosis or grief. The Daily Pulse brings rhythm to life, a precious ordinary experience that reawakens you to the beauty of a single moment. SolePath publicity on Nasdaq, December 28, 2018. We feel SO strongly about writing intentions we ‘shouted it out loud!’ on the New York Nasdaq. Free course on how to write the best intentions using the profound beauty of the Tao: SoleIntending – a spiritual guide to writing goals. SolePath is on News for the Soul on the 2nd Tuesday of the month at 9am PST starting September 11th.